It's tough being a hot-blooded nationalist in China these days. Your online rants about treacherous French hypermarkets get censored, and by the time you can organize a protest on the street, those protests aren't so welcome anymore. Since late last week the official press has been signaling that the recent outburst by Chinese bloggers outraged over anti-Chinese protests that have dogged the path of the Olympic torch must be wound down. Some Chinese have been calling for a boycott of the French retailer Carrefour, which has more than 100 outlets in China, after pro-Tibet protesters gave the torch a rough reception in Paris and the city council raised a banner on City Hall that read "Paris defends human rights all over the world." In recent days the front pages of state-run newspapers carried stories saying the best way for citizens to defend their country's honor is to build the economy and warning that, in today's globalized world, boycotts usually backfire (most of the good on sale in Chinese Carrefour stores are produced locally). Even on the Chinese Internet, where nationalist sentiment has been free flowing, posts calling for consumer action against Carrefour and videos of protests have now been blocked. Still, many are ignoring the government's call for calm. Beijing police on Saturday reportedly turned away a small group of demonstrators outside the French embassy. Carrefour stores in several mainland cities also saw large protests. Carrefour CEO Jose Luis Duran has been forced to deny accusations that his company has been a supporter of the exiled Tibetan spiritual leader the Dalai Lama. China's surge in public displays of patriotism  which has blossomed after the rocky reception of the Olympic torch in Europe and the U.S.  is a dilemma for Beijing. The government relies on patriotism to bolster its support now that socialism has disappeared as a unifying ideology. But expressions of strong nationalist sentiment can also lead to people protesting against the central government. "In crisis periods what often happens, and has happened throughout the 20th century, is that these foreign problems very quickly become domestic problems," says William Callahan, a China expert at the University of Manchester in the U.K. "People ask why the Chinese government isn't reacting more strongly to what is seen as foreign provocation." China has experienced similar spasms of public outrage following the accidental bombing by the U.S. of the Chinese embassy in Belgrade in 1999, and the collision of a Chinese fighter jet with a U.S. surveillance plane near Hainan Island in 2001. "What's different this year is how the people are much more involved," says Callahan. "I don't think this necessarily shows that it's a grassroots thing or a more genuine or more spontaneous thing. I think Chinese people have more access to express their opinion because of the rise of new media, blogs and bulletin boards and e-mail. What's happening is that Chinese people are recycling what they've been taught in school through patriotic education and also what they've been taught through China's broad-based propaganda campaigns." 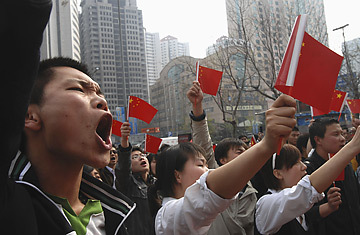 But protests are occurring beyond China's borders. Overseas Chinese, whose patriotism in the past may have been dulled by distrust of the Communist Party, are also demonstrating in support of their motherland and the Beijing Olympics. In Los Angeles, thousands of ethnic Chinese gathered outside the offices of CNN Saturday to protest what they call media bias and remarks by network commentator Jack Cafferty, who recently called Chinese "goons and thugs." The network later said that his comments referred to the government of China, not its citizens. The biggest risk for the Chinese government is that the protests simmer until the Beijing Summer Olympics begin in August. The authorities hope to show the world how China has changed in the three decades since Deng Xiaoping launched economic reforms. But it will be difficult to present a friendly, progressive face to the world if citizens are indulging in anti-foreign antics. "The world is shining a light on China in the year leading up to the Olympics," says Susan Shirk, a former deputy assistant Secretary of State during the Clinton administration and author of the book China: Fragile Superpower. "The timing is terrible." China has always feared embarrassing protests before the Games, but Beijing probably didn't expect them from its own patriotic citizens.